After creation, the SR types can be made visible on the Web Portal, and a custom form can be developed for each. See the Custom Web forms creation article. First, you must identify types of SR that are offered; see if some of them can be combined to simplify and reduce the number of SR types. In Octopus, you can categorize Service Requests. Consider a categorization that will be intuitive to search by the Service Desk, or by the users on the Web Portal (if enabled). By default, Octopus already has some service request templates (New request - Remote access, Request for training, Phone / voicemail box configuration). To make this SR type visible on the Web Portal, you must check the option in the "Web Portal" tab. A personalized form can be developed from this tab. The restriction applies to the requester, it works as well for requests created from the Web Portal as the ones opened internally. If the requester is not allowed to submit or ask for that request type, it will simply not come up in the list of choices. 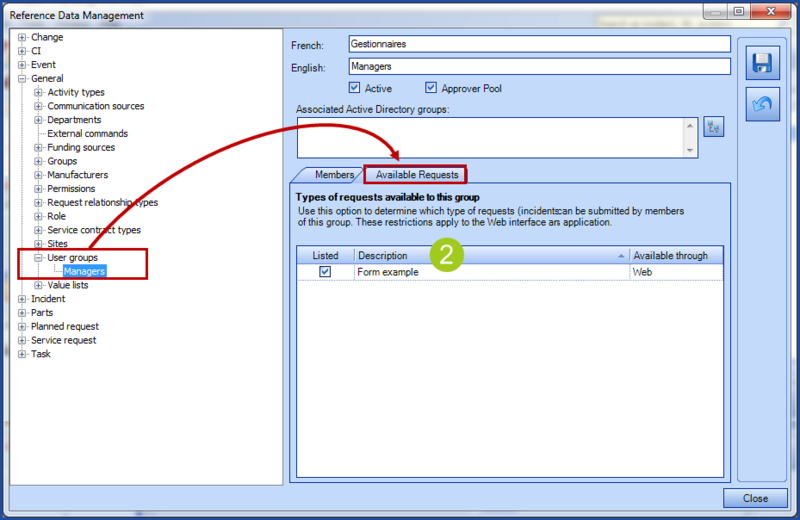 Open an existing request from the reference data management. Check the Restrict the access according to user groups option. Still in the reference data management. Go to the General > User groups section. Select a group or create a new one. Go to the Available Requests tab​. Select the requests that are allowed for the group. Go to the General > Site section. Go to the Available Requests tab​ and check the Request types visible for this site option. Select the requests that are allowed for the site from this list. A request will be restricted on the Web Portal as well as in the Octopus application. 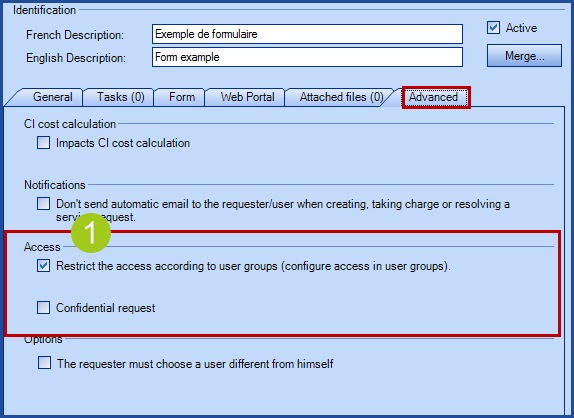 To allow an Octopus user to select a restricted request type, he must first choose a requester that is a member of the group or site allowed to use the restricted request. It is possible to add an internal procedure to a request. This option helps users who work in Octopus, you can add steps to be taken, etc. 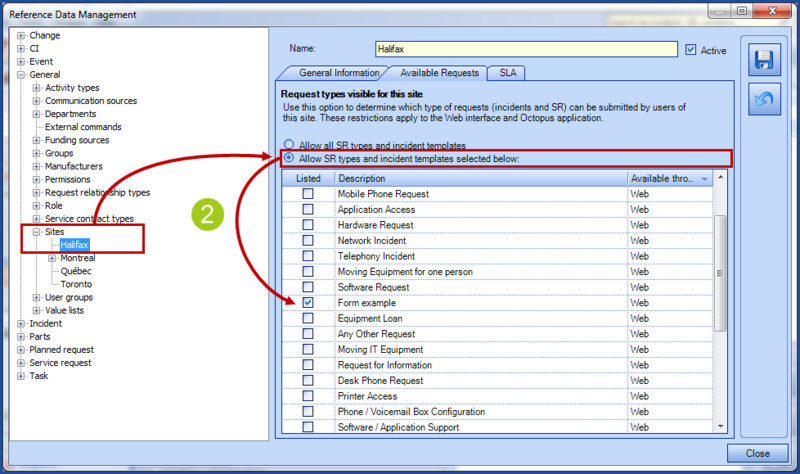 The information displayed is related to the selected service request type. The Display the procedure action can be used to display the request procedure. It is impossible to delete a SR type that has been used to create a request. You then have two options: uncheck the Active checkbox to deactivate the type, or Merge the type with another one. Merging will remove the link between the SR and the source type and create a new link to the destination type, and then source type is automatically deleted. You must delete SR type(s) before being able to delete a category. Execution steps of a service request can be defined in advance by configuring one or several tasks for a type. These tasks can be executed one after the other or in parallel depending on what needs to be done. We have configured tasks for certain service request that are part of the basic structure. If you wish to download the Excel file to work with it, click here. 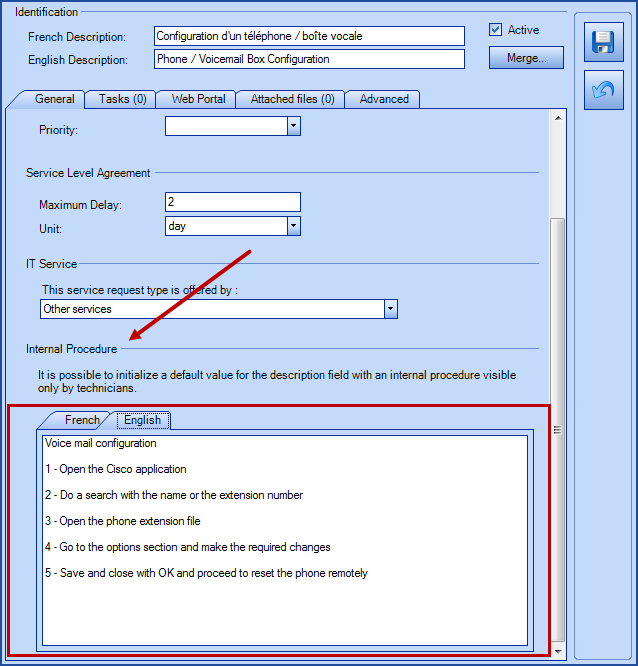 For more information on the tasks configuration, please see the Tasks Management article. When setting up the Web Portal, some types of service requests(SR) can be made visible to the users so they can submit requests on their own through the Web Portal. Forms created with Octopus can be customized in several ways; the objective is to gather the required information to facilitate the execution of a service request by the intervention teams. In order to facilitate the integration of Octopus, the interface has been pre configured with with default values that can be used as is or modified. For more information on the configuration of forms, please see Web Form Customization article.